Men (and women) manned up for men’s health this month, raising awareness to men’s health below-the-belt. 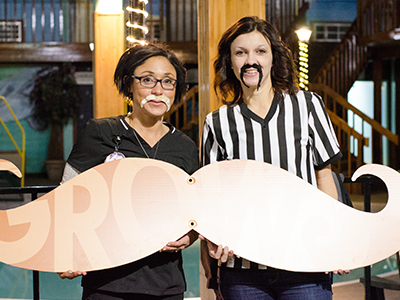 More than 40 people participated in Jamestown Regional Medical Center’s annual #GROWvember beard-growing competition. #GROWvember is a silly way to get the word out about a serious cause, said Dr. Robert J. Bates, JRMC’s Harvard-trained urologist. Facial hair shows you care, he said, and opens the door to conversations about below-the-belt subjects like prostates, bladders, kidneys. Men’s health below-the-belt can make a person squeamish, but ignoring symptoms can have a devastating effect. “Silence can be our worst enemy. Talking about these issues and seeing a specialist are the necessary steps to below-the-belt health,” Dr. Bates said. Proceeds benefited the JRMC Cancer Center. Misinformation about men’s health issues is abundant, Dr. Bates said, in part because it’s so private. Important questions you ‘mustache’ yourself: How often do you go to the bathroom? When you go, is it urgent? Do you have blood in your urine? Various treatment options are available locally. Patients can self-refer, meaning they don’t have to visit their primary physician first. They can make an appointment directly at JRMC. That cuts down on embarrassing conversations, Dr. Bates said.